It seems Motorola Xoom buyers are lucky for one more times. They were the first to get Android Honeycomb OS back in 2011, now a same thing happens again for Ice Cream Sandwich OS. 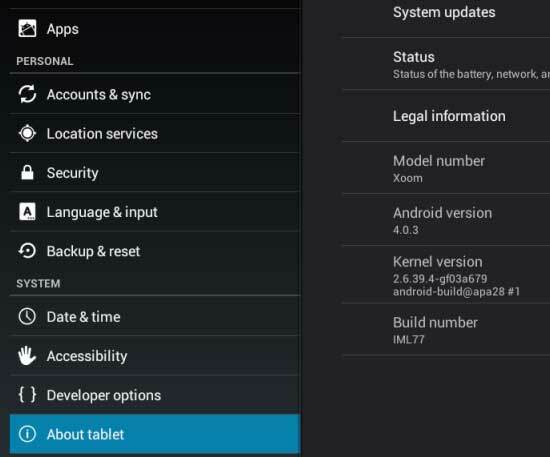 Motorola just started OTA rollout for Morotola Xoom tablet. Wait! That’s not all. It’s only available in US and only for Wi-Fi model. Good news is it's Android 4.0.3. Among the new features are a faster, updated browser, swipe to dismiss notifications, tasks, browsers tabs, the new app launcher, resizable widgets and more. Motorola also urges users to stay tuned because their Software upgrade site will be updated soon with information regarding the ICS update for other devices. There’s no word on which other devices Motorola will be releasing Ice Cream Sandwich OS. You can read the full PR after the break. tablet users. The software update includes numerous enhancements as well as providing additional features, and will roll out to XOOM. Install today for peak performance. For more information on Motorola updates and product support, visit us at www.motorola.com/myxoom. recognize individual facial features so you can give your friends big eyes, squeeze heads, make noses bigger, or change the scenery with background replacement. Richer, resizable widgets You can expand widgets to show more content, or shrink them to save space. You can receive the update over a Wi-Fi connection. If you are not connected via Wi-Fi, or your Motorola XOOM is off when the notification arrives, you will see the notification when you next connect to a Wi-Fi network. There is no charge for this update (other than any network data charges). Subject to change without notice.